My Review: I previously reviewed Laurence Gonzales book, Everyday Survival: Why Smart People Do Stupid Things. Everyday Survival is the second book in this series on survival by Gonzales. 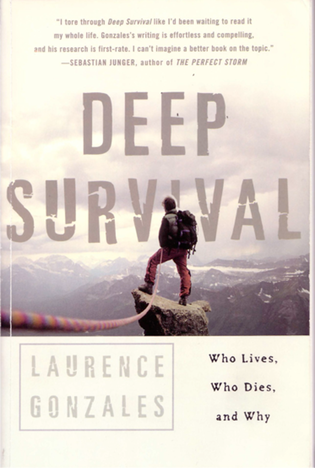 The book being reviewed here, Deep Survival: Who Lives, Who Dies, and Why, is the first book. I re-read it after reading Everyday Survival. I wanted to see if it was as good as I had remembered. If you have read the review on Everyday Survival, you know that I had some trouble with that book. It seemed to wander pretty far a field, dealing with survival in intellectual and often cosmic terms. The re-reading confirmed my earlier opinion of Deep Survival. It is an excellent book. It is much better grounded and contains analyses that can actually help in a survival situation. Gonzales dissects several accidents, identifying the mental and physical elements that enhance our chances of survival. In a chapter entitled “Memories of the Future”, Gonzales describes how the emotional components of past events, positive and negative, can drive behavior in the future. 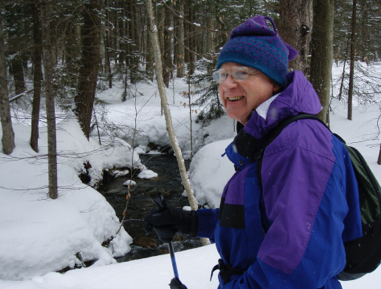 For example, he details the fate of eight snowmobilers returning from a search and rescue mission in Alberta, Canada. Even though warned of a severe avalanche condition, three members of the group leave the others to roar up the face of a mountain in an activity called “high marking”. These men had participated in this activity before. They loved the feel of speed as their powerful machines climbed higher and higher up the mountain until gravity stopped them. The adrenalin rush and emotional high they experienced in this activity in the past overwhelmed the intellectual knowledge that the activity could cause an avalanche. They had never experienced an avalanche before, so they had no emotional connection to the event. But they surely had a highly positive emotional connection to high marking. They wanted to feel that rush and feel those positive emotions again. Emotion trumped knowledge in this instance. An avalanche occurred and several members of the group died. This is not unlike the story of the three people on the beach as the Christmas Day tsunami roared ashore in Everyday Survival, Gonzales second survival book. Each person had a different emotional and intellectual connection to the idea of tsunami and the idea of the beach as a benign or possibly dangerous place. As a result, many peopled died while others saw the danger and lived. In another chapter entitled, “The Anatomy of an Act of God”, Gonzales makes the case that accidents are inevitable in risky activities (i.e. wilderness hiking, mountain climbing, kayaking, flying, etc. ), but that while a certain number of accidents will happen, an individual can take steps to prevent being the victim. He uses the image of sand slowly falling through an hourglass, creating a sand pile below. Most of the time the sand is stable, with each grain building the pile higher. But periodically the sand pile reaches a point where it is no longer stable, and the addition of one more grain causes the pile to collapse out of control until a new state of equilibrium is reached. Gonzales says that our participation in risky activities is like that. We go about these activities, trying to mitigate the danger, until they become almost routine. Then one small act destabilizes the sand pile and everything comes crashing down. As an example, Gonzales tells the story of a world-class rock climber. While preparing for her climb she is distracted by an onlooker asking her a question. As she begins her climb, something gnaws at her mind, but she dismisses it. After reaching the top, she backs off, beginning her rappel to the bottom and falls sixty feet, nearly killing herself. The one small thing, the grain that destabilized the sand pile, was the distracting question. It came as she was threading the safety rope through the belaying device. She stopped to answer the question, then bent to tie her shoe and began her climb, while a little voice at the back of her mind tried to alert her that she had forgotten something. In a second example, Gonzales tells of four friends, mountain climbers on Mount Hood. After a hard climb, they make the top and soon begin their decent. The four were roped together, something that is supposed to provide a measure of safety should one of the climbers slip. All four had practiced arresting falls by throwing themselves face down and hammering the blade of their ice ax into the frozen surface. This had always stopped a slide. As the four worked their way down, one person would plant the shaft of his ice ax in the frozen snow and use it to belay the others. When all had worked their way down as far as the rope would let them, the belayer would pull the ax, the bottom person would become the belayer and the process would start again. They had done this many times. But this time, when the belayer pulled his ax, he lost his balance and fell on his back. This was the grain that destabilized the sand pile. The whole system was based upon no slack in the rope, short falls, and falls coming from those below the top person. The belayer had thirty-five feet of rope between him and the next climber. By the time all the slack in the line was used up, he had rocketed past the second climber, sliding a full seventy feet before the rope snapped taught and he pulled number two, and then three and four with him off the mountain. On the way down, this group collided with another and carried them off the mountain too. As a result, several died and the rest were severely injured. In this case, what seemed like a trivial event, the pulling of the belay, turned out to be the grain that destabilized the sand pile, and all the careful planning came crashing down. Gonzales claims that such accidents will happen, but do not have to happen to you or me. Practice, a willingness to adapt plans to developing conditions, training to keep emotional reactions in check and survival training among others can enhance your chances of survival. Yet he points out that you can be the perfect survivor with the correct attitude and ability to adapt to conditions and still die. While some folks who do everything wrong, survive. All you can do is skew the odd in your favor. In the end, it’s still be a craps shoot. Gonzales tells the story of a plane flying over the Amazon jungle that crashed. Several adults and one teenaged girl survived. She was dressed in a white confirmation dress and white heals, and had a broken arm. Not your basic jungle survival gear or condition. The adults decided to stay put and wait for rescue, as we are taught to do in survival training. After waiting a day, the girl set off through the jungle alone. By all rights, she should have died. But after several weeks in the jungle, she made it out, while the others died. His lesson here is that sometimes the rule breakers survive while the rule-bound do not. Still, I wouldn’t have bet on the girl. There is so much to this book, I could go on for much too long (perhaps I already have). While it has a chapter called “The Rules of Adventure”, this is not really a how-to book. It is more about understanding the anatomy of an accident and the psychological factors that impact survival - life or death. I highly recommend it to anyone who has ever participated, even casually, in a risky sport or activity. I’m sure you will pull something of value out of it. And, it’s a good read. I’ve read it twice and could read it again – just not right away!